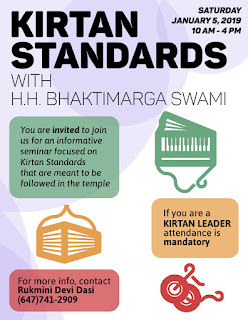 Kirtan Standards Seminar - Saturday, January 5, 2019 ~ The Toronto Hare Krishna Temple! The Toronto Hare Krishna Temple is pleased to announce the next Kirtan Standards Seminar with HH Bhaktimarga Swami on Saturday, January 5th, 2019 from 10:00am - 4:00pm at our lovely temple at ISKCON Brampton. This informative seminar will present the proper etiquette and standards that are meant to be followed at our temple with respect to leading kirtans. Moreover, this will give an opportunity to ask questions and discuss various topics related to kirtan. This seminar is mandatory for all present kirtan leaders as well as anyone who would like to lead kirtan in the future. We also encourage anyone who participates in kirtan (mrdanga and kartal players, etc.) to attend as well. To attend the seminar, please fill out the simple registration by CLICKING HERE and please forward to anyone who may also be interested in this seminar! If you have any questions, please don't hesitate to contact us at info@torontokrishna.com. We hope to see you all there!